October 17, 2016 — It’s time to establish the political equivalent of the Doomsday Clock—a new symbol that illustrates how close Americans are to electing a president that might undermine American democracy. It’s a tangibly real possibility today and—regardless of how the 2016 presidential election turns out—it’s likely to be an ongoing threat in the years and decades to come. It should be obvious that granting presidential power to an individual who speaks and acts like a strongman would be a disaster not only for the United States, but for the entire planet. As leader of the leader of the free world, a U.S. president who advocates policies that would be right at home in, say, a fascist regime, totalitarian state, or dictatorship (among other possibilities on the political leadership spectrum) would be a serious threat to the safety and security of other nations, not to mention the safety and security of the American people. This is one good reason to invoke the internationally-recognized Doomsday Clock, which, since 1947 has “convey[ed] how close we [humans] are to destroying our civilization with dangerous technologies of our own making,” including nuclear weapons. We need a similar easy-to-recognize symbol that gets Americans to stop and think twice about supporting—and then voting for—a leader that expresses disdain for democratic institutions and the hard-won values we should hold dear. Because apparently, at this moment in time, a shockingly large percentage of Americans are ready, willing, and even wildly enthusiastic about the idea of casting aside the Constitution and American values simply because they don’t trust the media, are sick of the political establishment, or desperately want to believe that there’s a simple, easy answer for every problem we face. The idea that a strongman is somehow going to lead to a national rebirth or provide quick and easy answers to our problems is difficult to embrace, considering that modern strongmen have an unenviable track record when it comes to bettering the lives of their constituencies. It seems the American people are most likely to veer into the dangerous waters of supporting a strongman-type when they believe the American political system isn’t working—or isn’t working for them. For decades, a particularly noisy portion of our media has been telling us that our government doesn’t work, and apparently that message has been repeated often enough that a majority of Americans believe it’s true. Naturally, there are issues with our government. American democracy, as great as it is, isn’t perfect and never will be. And obstructionism seems a particular problem these days. But take a few steps back and compare our government to other countries around the world, and it (still) looks pretty damn good. Try visiting a few countries that are led by a strongman—or are pursuing the kinds of policies that one of our presidential candidates has been advocating—and then compare their government/economy to the American government/economy and you’ll stop complaining right quick. It’s alarming that so many millions of Americans seem prepared to elect a candidate who is not only ignorant about the Constitution and the Bill of Rights (recall that the candidate in question once highlighted Article 12 of the Constitution, apparently unaware that there are only seven Articles), but downright hostile to the protections expressed therein. Worse yet, in the second presidential debate, this same candidate actually said: “If I win, I am going to instruct my Attorney General to get a special prosecutor to look into [his political opponent’s] situation,” before going on to say that if he was in charge his political opposition “would be in jail”—a quip that generated a roar of approval from a portion of the live audience. This candidate has also called for journalists to be jailed, another scarily un-American statement. Shouldn’t the problems with these messages be self-evident? And prompt the American populace to readily dismiss said candidate with extreme prejudice? What’s truly terrifying, though, is that regardless of what happens on November 8, sooner or later a presidential candidate is going to come along who is a wolf in sheep’s clothing—someone who is smart, eloquent, charismatic, and circumspect about their intention to undermine our democracy. How is the less-well-informed portion of our electorate going to recognize and reject such a candidate when they can’t, or won’t, completely repudiate a candidate who very visibly dangerous and hostile to American values? I wish I had a ready-made suggestion for what this political Doomsday Clock symbol should be, but perhaps this is something that should be crowd-sourced? Get the word out by sharing this column via social media, and by using the hashtag #politicaldoomsdayclock. Or tweet your feedback or suggestions to us @failuremag. 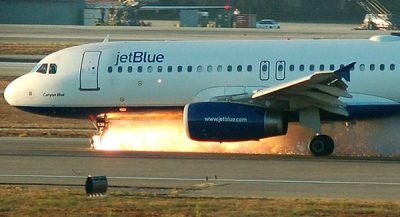 NTSB: JetBlue plane landed with parking brake on—A preliminary finding by the NTSB reveals that the JetBlue plane that blew out four tires at Sacramento International Airport last month had its parking brake engaged during landing.